Not to be confused with Selenite (ion). Earthy – Dull, clay-like texture with no visible crystalline affinities, (e.g. howlite). Fibrous – Thin, elongated fractures produced by crystal forms or intersecting cleavages (e.g. asbestos). All varieties of gypsum, including selenite and alabaster, are composed of calcium sulfate dihydrate (meaning that it has two molecules of water), with the chemical formula CaSO4·2H2O. Selenite contains no significant selenium, the similarity of the names of the substances coming from the Ancient Greek word for the Moon. Some of the largest crystals ever found are of selenite, the largest specimen found in the Naica Mine's Cave of the Crystals being 12 metres long and weighing 55 tons. The etymology of selenite is through Middle English selenite, from Latin selenites, from Greek selēnitēs (lithos), literally, moonstone or stone of the moon, from selēnē (Moon). The ancients[who?] had a belief that certain transparent crystals waxed and waned with the moon. From the 15th century, "selenite" has referred specifically to the variety of gypsum that occurs in transparent crystals or crystalline masses. All varieties of gypsum are very soft minerals (hardness: 2 on Mohs Scale). This is the most important identifying characteristic of gypsum, as any variety of gypsum can be easily scratched with a fingernail. Also, because gypsum has natural thermal insulating properties, all varieties feel warm to the touch. most often transparent and colorless: it is named after Greek σεληνη "the moon". the satin spar name can also be applied to fibrous calcite (a related calcium mineral) – calcite is a harder mineral – and feels greasier, waxier, or oilier to the touch. Varieties of gypsum known as "satin spar" and "alabaster" are used for a variety of ornamental purposes like sculptures and a substitute for window glass. But also because of the long history of the commercial value and use of both gypsum and alabaster, the four crystalline varieties have been somewhat ignored, except as a curiosity or as rock collectibles (not commonly used). "Gypsum flower" speleothem, Mammoth Cave Kentucky. Orange color is iron oxide from groundwater. Wikimedia Commons has media related to Gypsum flowers. Azurite-gypsum "Buda Rock", Ray Mine Arizona. 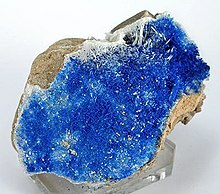 A core of glassy and colorless gypsum crystals up to 1 cm in length with a druse of royal blue azurite, to 0.5 cm in length on the smaller gypsum crystals and included within the larger ones. 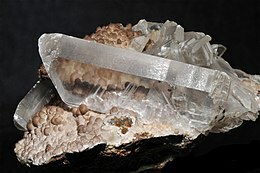 Gypsum crystals can be transparent (most often selenite), translucent (most often satin spar but also selenite and gypsum flowers), and opaque (most often the rosettes and flowers). Opacity can be caused by impurities, inclusions, druse, and crust, and can occur in all four crystalline varieties. Both selenite and satin spar are often glassy or vitreous, pearly, and silky – especially on cleavage surfaces. Luster is not often exhibited in the rosettes, due to their exterior druse; nevertheless, the rosettes often show glassy to pearly luster on edges. Gypsum flowers usually exhibit more luster than desert roses. Fibrous satin spar exhibits chatoyancy (cat's eye effect). When cut across the fibers and polished on the ends, satin spar exhibits an optical illusion when placed on a printed or pictured surface: print and pictures appear to be on the surface of the sample. It is often called and sold as the “television stone” (as is ulexite). Some selenite and satin spar specimens exhibit fluorescence or phosphorescence. All four crystalline varieties are slightly flexible, though will break if bent significantly. They are not elastic, meaning they can be bent, but will not bend back on their own. All four crystalline varieties are sectile in that they can be easily cut, will peel (particularly selenite crystals that exhibit mica-like properties), and like all gypsum varieties, can be scratched by a fingernail (hardness: 2 on Mohs Scale). The rosettes are not quite as soft due to their exterior druse; nevertheless, they too can be scratched. Selenite crystals that exhibit in either reticular or acicular habits, satin spar, in general (as fibrous crystals are thin and narrow), desert roses that are thinly bladed, and gypsum flowers, particularly acicular gypsum flowers, can be quite brittle and easily broken. All four crystalline varieties can range in size from minute to giant selenite crystals measuring 11 meters long such as those found in the caves of the Naica Mine of Chihuahua, Mexico. The crystals thrived in the cave's extremely rare and stable natural environment. Temperatures stayed at 58 °C, and the cave was filled with mineral-rich water that drove the crystals' growth. The largest of those crystals weighs 55 tons, is 11 meters (36 ft) long, and is over 500,000 years old. Gypsum occurs on every continent and is the most common of all the sulfate minerals. Gypsum is formed as an evaporative mineral, frequently found in alkaline lake muds, clay beds, evaporated seas, salt flats, salt springs, and caves. It is frequently found in conjunction with other minerals such as, copper ores, sulfur and sulfides, silver, iron ores, coal, calcite, dolomite, limestone, and opal. Gypsum has been dated to almost every geologic age since the Silurian Period 443.7 ± 1.5 Ma. In dry, desert conditions and arid areas, sand may become trapped both on the inside and the outside of gypsum crystals as they form. Interior inclusion of sand can take on shapes such as an interior hourglass shape common to selenite crystals of the ancient Great Salt Plains Lake bed, Oklahoma, US. Exterior inclusion (druse) occurs as embedded sand grains on the surface such as, commonly seen in the familiar desert rose. When gypsum dehydrates severely, anhydrite is formed. If water is reintroduced, gypsum can and will reform – including as the four crystalline varieties. An example of gypsum crystals reforming in modern times is found at Philips Copper Mine (closed and abandoned), Putnam County, New York, US where selenite micro crystal coatings are commonly found on numerous surfaces (rock and otherwise) in the cave and in the dump. Whereas geology, mineralogy, and rockhounding groups, clubs, and societies as well as museums usually date (of find and geologic), photograph, and note location of minerals, much of the retail mineral and jewellery trade can be somewhat casual about dates, locations, and descriptive claims. Selenite from Rio Grande Do Sul, Brazil on display at the Rice Northwest Museum of Rocks and Minerals in Hillsboro, Oregon, Oregon, USA. ^ "Gypsum Mineral Data". Weinrich Minerals, Inc. Retrieved 20 October 2013. ^ Etymology of selenite from the New Collegiate Dictionary. ^ "Habit". The mineral identification key. Mineralogical Society of America. Retrieved 20 October 2013. ^ "Kristallgrotte – photograph of selenite crystals in the (below)". Archived from the original on 2007-02-17. ^ Jochen Duckeck (27 December 2011). "Marienglashöhle". showcaves.com. Retrieved 20 October 2013. Show Mine, Germany – selenite was commonly used in Germany during medieval times for glass panes in windows and, in particular, for coverings of pictures of the Madonna. In Germany, this form of selenite was usually referred to as Marienglas or Mary’s Glass. ^ Jeffrey Shallit and Peter Russell. "Ulexite or Satin Spar Gypsum? The Scoop on "Television Stone"". University of Waterloo, Canada. CS1 maint: Uses authors parameter (link) discussion whether ulexite or satin spar is the “real” television stone. When the optical illusion that some satin spar can exhibit was “discovered”, satin spar was “marketed” as ulexite, rather than as a gypsum variety. Ulexite is a different mineral. ^ Alleyne, Richard (2008-10-27). "World's largest crystal discovered in Mexican cave". London: The Telegraph. Retrieved 2009-06-06. This page was last edited on 21 March 2019, at 14:14 (UTC).